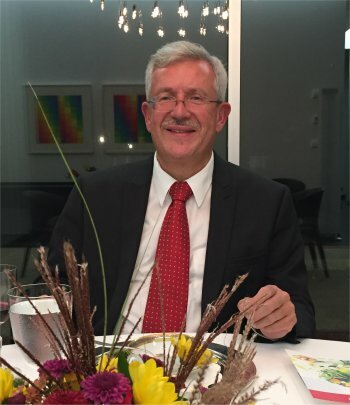 Martin Dahinden, Ambassador of Switzerland to the United States, is fascinated by food. “When the decision was made that I would come to the United States, we were thinking about culinary issues and what to present here. Most of my colleagues were thinking very traditional Swiss dishes like fondue. 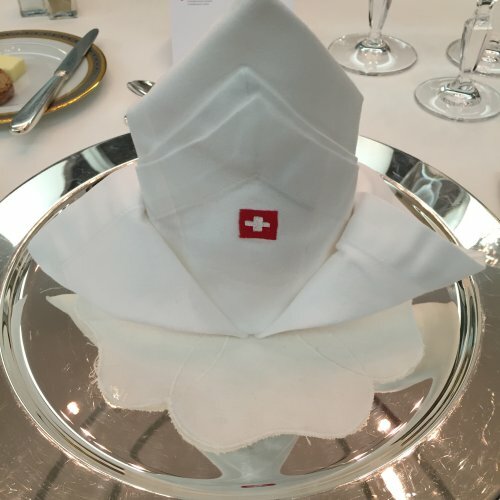 But Switzerland has produced a lot of people who had an important impact on culinary history, and those stories are not known,” Martin told me as we met for dinner at his official residence. One of those stories is the life of Oscar Tschirky. Born in Switzerland, he emigrated to the United States and gained fame in early 1900s New York City as maître d’hôtel of Delmonico’s Restaurant and then the Waldorf-Astoria hotel. He created the Waldorf salad of apples, celery and walnuts, and published a cookbook with recipes from the hotel’s renowned kitchen. And it was those dishes that inspired the menu that Martin and I shared at the Swiss Residence for the latest dinner with a stranger. 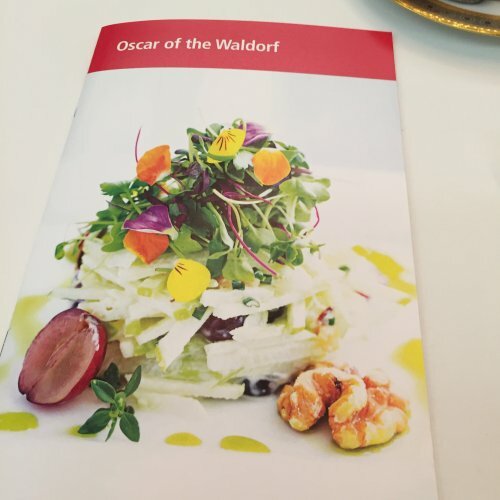 Martin worked with the chef of the residence — his home away from home in Washington, DC — on crafting a four-course tribute to Oscar by modernizing recipes from the Waldorf-Astoria’s past. “Oscar was from a very poor family in the French-speaking part of Switzerland, but he made an outstanding career in the United States,” he said. We raised our glasses of white wine in celebration of Oscar, and then Martin gave me a tour of the residence’s ground floor (his apartment is on the second floor). It’s a beautifully designed, modernistic home in the shape of the white cross that emblazons the Swiss flag. 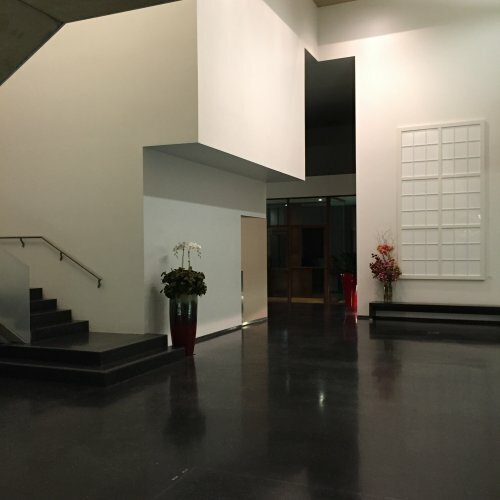 Throughout the rooms there’s a variety of Swiss art on display, everything from Civil War-era paintings from a Swiss artist who traveled to the States at that time, to more modernistic artwork. 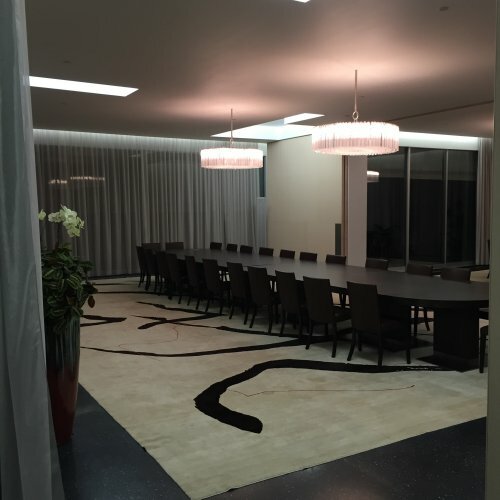 There’s a massive dining table that can seat dozens of guests in another room, and a grand piano in the stark entrance hall (Martin doesn’t play, his artistic hobby is painting). 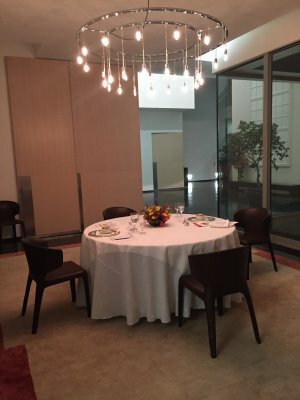 As we sat down at a table laid out for two, Martin explained how the residence’s ground floor is constantly in use for a wide variety of events. The night before he had hosted a screening of a Swiss film that the country’s embassy is pushing for an Oscar nomination. The exact same space, currently decked out with comfortable chairs, recently hosted a flight simulator. In the coming days, there might be an elaborate dinner for U.S. politicians and all the protocol that involves. In Switzerland, there’s less formality and protocol, which he attributes to a national belief that everyone is equal and that no one person has too much power — even the presidency changes hands once a year. So how did Martin get up to speed on U.S. protocol? “I did what I always do: look at what works well and what doesn’t, and you find out quite fast,” he said with a smile. “This is usually my approach. I don’t want to come in and invent a new system and then everybody gets frustrated that nothing works,” he added. Our friendly waitress then arrived with the first course of oyster soup. 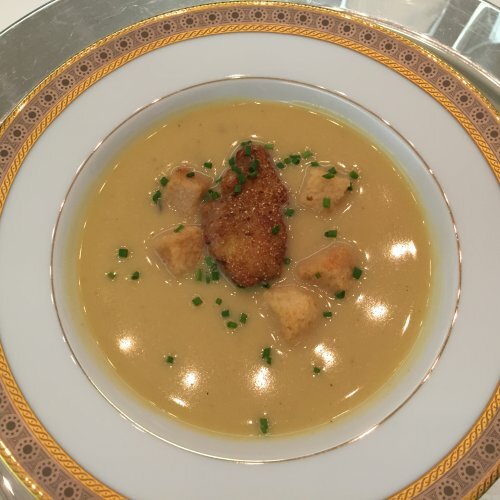 Based on a recipe that Oscar might have overseen chefs cooking in the kitchen of the Waldorf-Astoria, the delicious soup featured a breadcrumb-coated oyster floating in the middle. Seasoned with lemon juice, parsley, nutmeg and fish stock, it was outstanding. Talk of Oscar’s childhood in Switzerland moved onto Martin’s own early years in his home country. 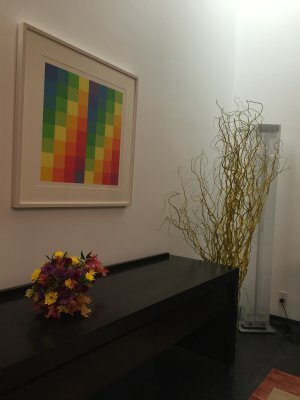 He was born in Zurich in 1955 and as a child was “fascinated” with art, something he credits to his grandfather who did restorations of paintings and also painted. “I think I would have been talented if I had more time to paint, but it never happened,” Martin said. His parents told him that art wouldn’t be a serious career and to choose another goal, which presented him with a tough life choice. “I was — and still am — a person interested in many things. I found it difficult when I was young to decide to go in one direction or another. Economics, politics, history, painting, arts, all of these were fascinating to me,” he added. Eventually he settled on pursuing the field of economics, getting his Ph.D. in business administration from the University of Zurich. After graduation he worked in various roles including as a postgraduate assistant at his former university. It was there when a colleague told Martin that he might like a career in the Swiss diplomatic service, because it offered the potential for new roles in different countries every few years. The suggestion piqued his interest. “Nobody in my family was a diplomat, so this was not something that I had in mind,” he said. He managed to succeed in the “very competitive” application process and he’s been in the diplomatic service ever since. Some of the many positions he’s held include director of the Swiss Agency for Development Cooperation; director of the Geneva International Centre for Humanitarian Demining; deputy to the Swiss ambassador in Nigeria; and postings elsewhere around the world. The variety is also interesting intellectually, he said. In one job he had to defend budgets and prioritize spending. In another he oversaw efforts to remove landmines left over after wars in the former territory of Yugoslavia in the 1990s. For many of the positions Martin took on, he didn’t necessarily have expertise in the subject matter — but was still the favored candidate. The people who appointed him to the roles “knew better my strengths and weaknesses than I did,” said Martin. “They knew that technical issues do not matter as much as my ability to bring people together. I can push things forward but I am not the keeper of the whole knowledge and the context,” he added. His success as a diplomat appears to be a combination of his ability to quickly learn new issues, his love of teamwork, and his calm, approachable demeanor. Martin’s welcoming nature made the meal feel less like a formal interview and more like a relaxed evening together, even in the awe-inspiring setting of the residence. 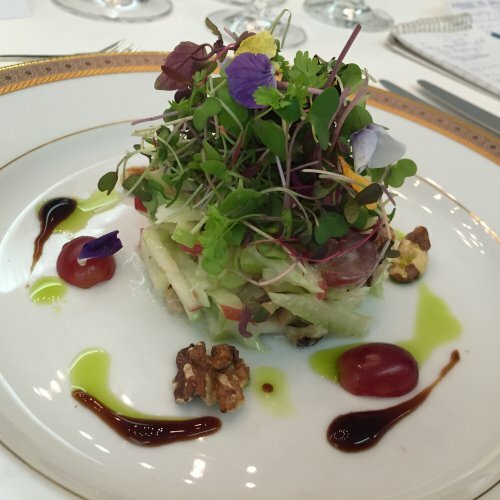 The salad was the classic configuration of celery, apples and grapes in a gorgeous presentation that made me almost rueful to eat it. But I’m glad I overcame any hesitation because the crisp, fresh salad was delicious, as were the walnuts dotted around the plate. 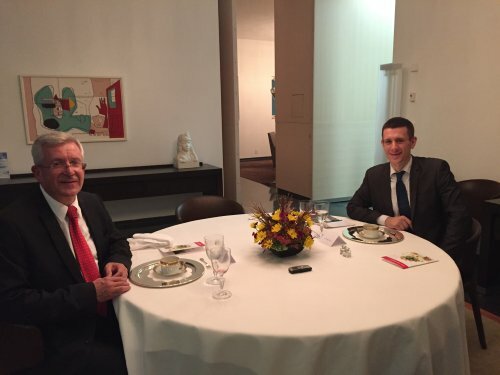 While we ate, Martin told me that his selection as ambassador did not come as a surprise because long before the official appointment he had an agreement with the Swiss foreign minister about being selected for the role. Does the Swiss position of neutrality in foreign affairs help or hinder his work? “It helps,” he said, as it allows the country to mediate between two nations that might otherwise not talk to one another. Similarly, it allows Swiss diplomats to reach out to countries that might be politically poisonous for other countries to even contemplate negotiations with each other on sensitive topics. No such problems with the Swiss, who Martin said do not attempt to project power over other countries because of the neutrality position. Instead, he’s spending his time as ambassador to project an image of Switzerland in the United States different from stereotypes that some people might hold. Promoting Switzerland as a cutting-edge place to do business is vital for Martin, because he wants to show off the “enormous potential” for joint economic, research and other activities between his home country and the United States, either investing in the States or in Switzerland. “We’re not strange people with cowbells,” he added, with another warm smile. 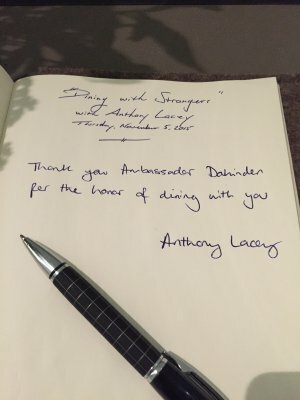 The Swiss might not be the Alps-dwelling stereotypes some have of the country, but based on my meal at the residence they certainly know how to write great recipes. Our third course was chicken “Waldorf style,” which was a chicken breast atop a mound of mashed potato and served with a unique sauce of Maderia wine, egg yolk, and cream with a dash of truffle oil. Another great dish by resident chef Joao Marcos Barboza. The menu touts Joao as having taken the old dishes from the Waldorf-Astoria and transforming them into new versions. “This is very rare,” Martin said of the chicken. 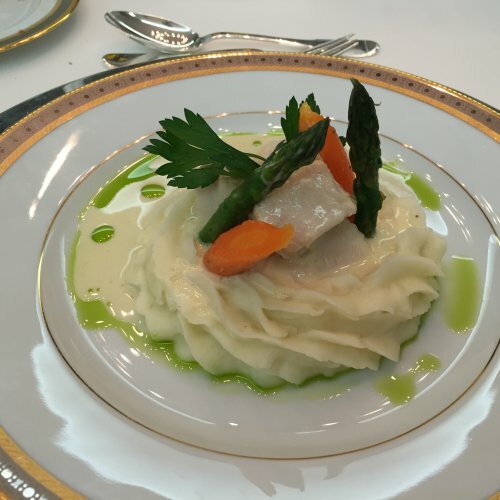 “This was very typical for its time as it used Madeira in the sauce, that was common back then,” he added, pleased to be talking about the history of the dish. Every day is different for Martin, who is usually at his office in the embassy building next door by 7am. He’s very hands-on, checking all the emails that he receives rather than delegating them to someone else. And he walks freely between the residence and the embassy — and around Washington — without a security guard, as he doesn’t feel he faces any major threats. “You need to be realistic. Being a victim of a crime or a terrorist act as Swiss ambassador is much less realistic than having a car accident or an accident in the street. I don’t feel threatened here,” he said. I wondered whether there are times when he disagrees with Swiss foreign policy, but he said such instances are few and far between, so that’s never a challenge. Instead, he said the challenge he faces is the workload and time management with the embassy’s many tasks. He credits his team of about 60 colleagues in helping with that, saying he’s a big fan of their teamwork. Martin didn’t bite when I asked him about negatives about living in the United States, but he was more than happy to elaborate on the benefits of his life in the District. “I like the culture, all the opportunities out here. You can live freely. I was once in Nigeria and there I couldn’t put on jeans and go for a walk to the Metro station like I do here,” Martin said. The job also allows Martin to continue to indulge his varied interested in culture, economics, finance, law, politics and other affairs. “I’m really happy,” he said. I was also deliriously happy at the meal, particularly when dessert arrived. The fourth course was a sherbet, again done Waldorf style. 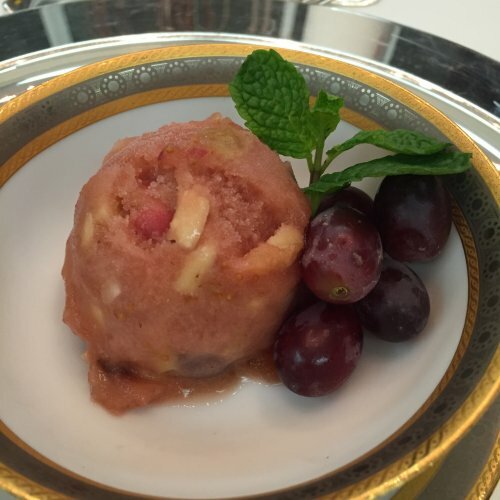 The sugary sherbet combines raisins, figs, cloves, cinnamon, almonds, grapes and dashes of orange and lemon juice with a cup of port wine. It’s very rich, looks great in the bowl, and is impossible to resist. “This is only the third time we’ve made this,” Martin said. In-between my rapid attacks on devouring the dish, I questioned whether Martin’s love of the United States might lead him to settle down here once he retires as ambassador. Not a chance. He, his wife Anita, and their daughter Andrea plan on returning to Switzerland after his posting concludes. Martin and Anita’s son Robert is remaining in the home country during the ambassadorship as his parents didn’t want to disrupt their son’s education. The family owns a medieval house in the city of Bern that they renovated after buying it seven years ago, and that’s where they’ll settle. What life lessons might Martin take back with him? On the flip side, what does he think the United States could learn from Switzerland? He paused and grinned. “This is a tricky question because I’m not here to give other countries advice,” he said. After assuring Martin that I wasn’t trying to spark an international incident, he offered the answer that the Americans could learn from the Swiss educational model that offers apprenticeships to students, who use them to earn money and learn valuable skills. In Switzerland, the experiences gained through the work placements often lead to well-paying jobs with good prospects. In the United States, he suggested apprenticeships are perhaps not seen as desirable. All these issues are things Martin thinks about as ambassador, but he also finds time to relax with hobbies including reading, walking and bicycle riding. He’d also like to take up painting again if he could find the time. Yet while a lot of his waking time is dedicated to his job, he’s not concerned about finding a work/life balance. 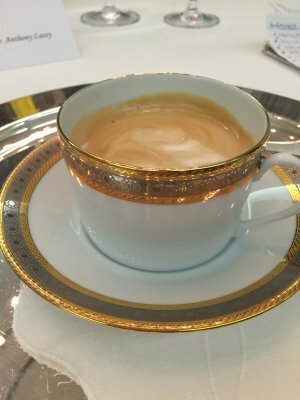 After a cup of coffee, my meal with Martin was coming to an end. He’s happy when he gets the chance to talk about food in the context of history and Switzerland. “There’s a lot of history in food, and I am interested in that,” he said, and he’s currently writing a book that will combine historical anecdotes with recipes from various parts of Swiss history. As we finished our meal, I asked Martin whether he’s enjoying life as an ambassador. It was a pleasure meeting you at the Swiss Ambassador’s residence Wednesday night. What a charming and insightful interview! Have to ask – which meal did you prefer? The first that is described in the interview, or the one we had Wednesday night? And don’t go “diplomatic” on me. Great meeting you too! I’ll have to be diplomatic and say they were both fantastic for different reasons.